FitzMartin brings over 25 years and 5,000 client engagements of experience to you through our Marketing and Sales Support Planning Retreat offer. That means we know when to turn, go straight, stop or accelerate. Putting the effort into your marketing plan can pay huge dividends if you do it right. Planning is doing it right, and we are here to help. Interested in learning more? Fill out the form for our Sales and Marketing Planning Retreat brochure. 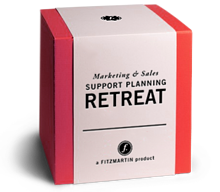 To learn more about FitzMartin's Marketing and Sales Support Planning Retreat offer, contact us through the form below.